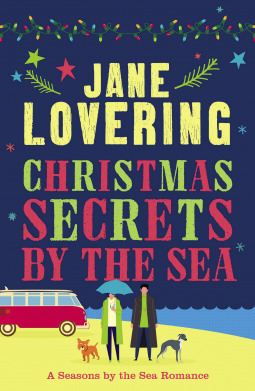 MY THOUGHTS: "Christmas Secrets by the Sea" is just the kind of book I like to read during the holiday season. Christmas is present but it isn't thrown in your face and there is a lot going on besides just cute romance. In the beginning of the book, the reader is introduced to Tansy and a scraggly stray she eventually names Brian. We know that Tansy is down on her luck, just recently losing her business, her home and her boyfriend. She has chosen to park her caravan on Dorset Beach and wait out the holidays. What she doesn't plan on is meeting new people and learning that sometimes you really can chose your own family. There's lots to love about this book. There is a wonderful small town feel and as Tansy discovers a new job scouting filming locations for a local production company, she meets many new, wonderful and nerve-racking individuals. There is also a great puppy love story between Brian and a whippet named Seelie - talk about odd couples. There is some romance thrown into this book so if that turns you off, then you won't want to give it a go. But it's not over-the-top and it's actually a love-to-hate trope which I am finding I enjoy quite a bit. And there are some pretty dark secrets which are exposed by the end and it only made me love Tansy and Davin even more. I probably wouldn't pick a book like this up to read most of the year but it was a perfect fit for the holiday season. And come on, with Brian and Seelie, you pretty much know it's going to be something I enjoy. I'm curious about the rest of the series when it releases because if it focuses on some of the characters we've already met, I'm anxious to see where it's headed. I totally agree. This one was really cute. No surprise to see a dog holiday season book from you! Great review. Looks really cute! Thanks Melanie. It was a good read for this time of year. And I think I'm curious where the series is headed. YES! That's true. Although they are cartoons, they are pretty accurate too. This sounds like something I would like. I like just a touch of Christmas in my Christmas books. Yea, I don't like too much in my books either. I know. Brian is such an awesome dog. I think you'll love him! This sounds fun and complex, and a treat to read at Christmas. It was. I'm so glad I gave it a chance. Oh, Barb, this sounds like such a cute read! At the same time, though, it also sounds like there's some suspense involved, with those dark secrets you've mentioned. And the romance between Brian and Seelie sounds SO adorable!! 2019 Challenges! Let the Fun Begin! We Interrupt This Program for a Football Update! I Love Him - Furry Paws and All!